Chilled soup and salads are what my stomach wants as the temperature rises. Some days are so hot it seems that the only way to cool down is from the inside out. It’s taken me years to get Cheryl to accept soup and bread, or a large dinner salad, as a whole meal. I have a whole bag of salad tricks that gets her just as excited by salad as I am. The first thing to remember is to use at least half romaine because that it is the lettuce she likes most. A chopped salad with a protein that she likes, all tossed with just the right amount of dressing helps too. When I got my first salad spinner in the 90s it was a life changer. I felt like it gave me more last minute and much less soggy salad choices. Before that I was wrapping my soaking wet lettuce in a clean dishtowel and it seemed like it took forever. My first salad spinner actually had a string that ran through the lid that created the spinning when you pulled the ring at the end of it. As you can imagine, it didn’t have a very long life! 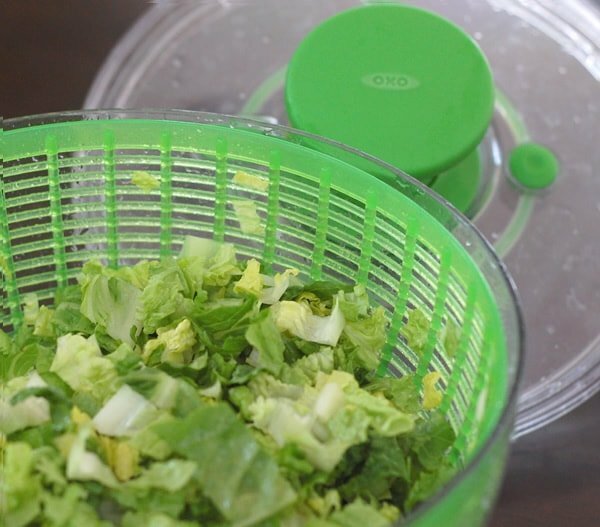 I love my OXO salad spinner – enough to have two sizes – a large one for dinner salads like this and a smaller one. It has a big pump in the middle that causes the spin and the little one even has a lid so you can store some ready-to-go lettuce in the fridge. When I bring heartier lettuces like romaine home I wash and spin first, then store it chopped and clean in the fridge. If it’s easy to eat you are more likely to whip up a salad instead of going out to dinner. The dressing was inspired by my weekend at Eat Write Retreat. The California Avocado Comission was there and we even had a whole dinner of avocado based recipes. It didn’t hurt that I brought back some avocados either. 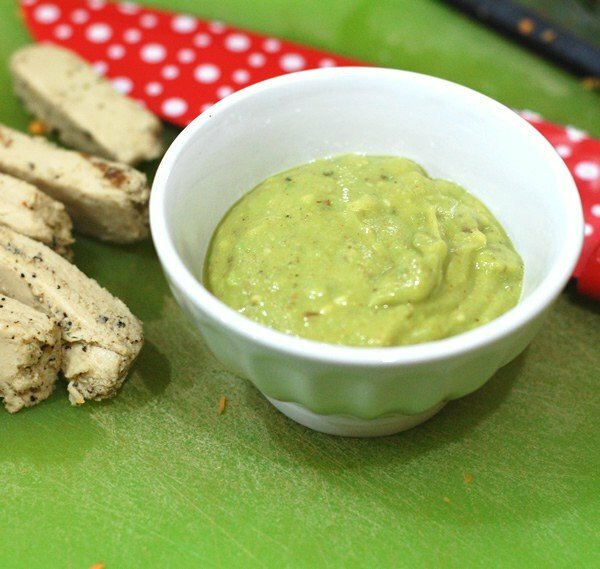 Expect a recipe for avocado cashew cream chez in the very near future. 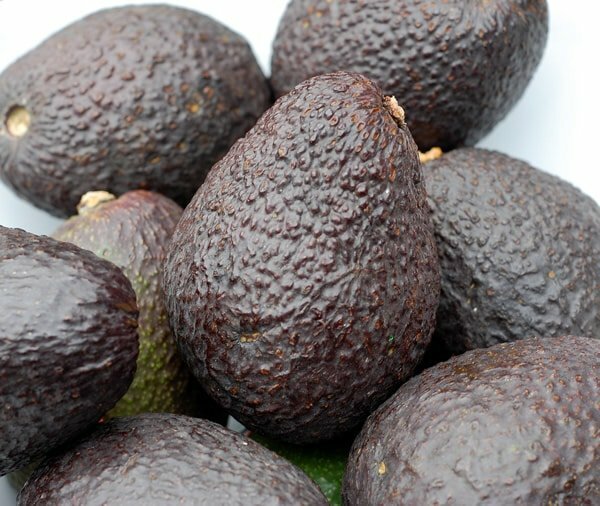 Avocados are just so luscious – creamy, thick, rich and have a delicate flavor that you can work into almost any dish. It’s the perfect base for a dressing. Plus it makes this dressing no oil added – in addition to being gluten-free, soy-free and, of course, vegan. 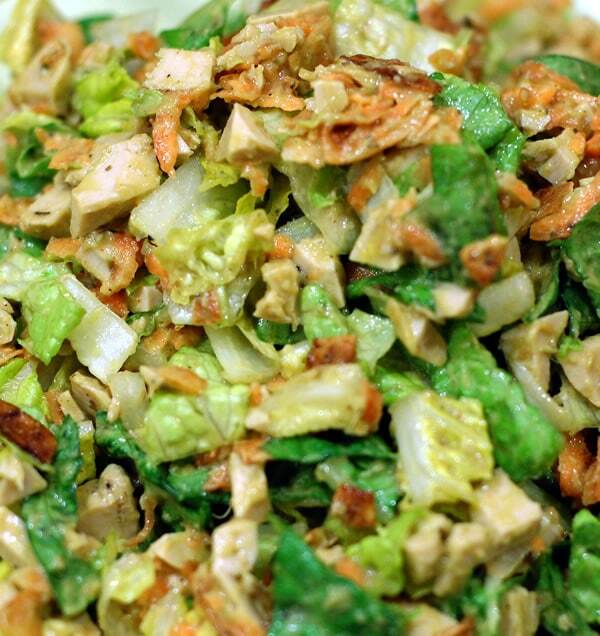 This incredibly simple salad is composed of 2 chopped romaine hearts, 1 grated carrot and has about 1/2 container of Beyond Meat Chicken-free Strips. Cheryl loves them and so do I. They are a great gluten-free meat substitution and perfect to have on hand for summer salads. 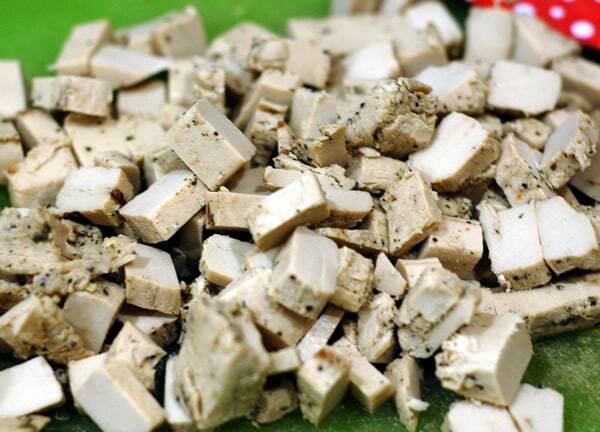 In fact, we’re having chicken-less salad sandwiches for dinner tonight with the leftover Beyond Meat. 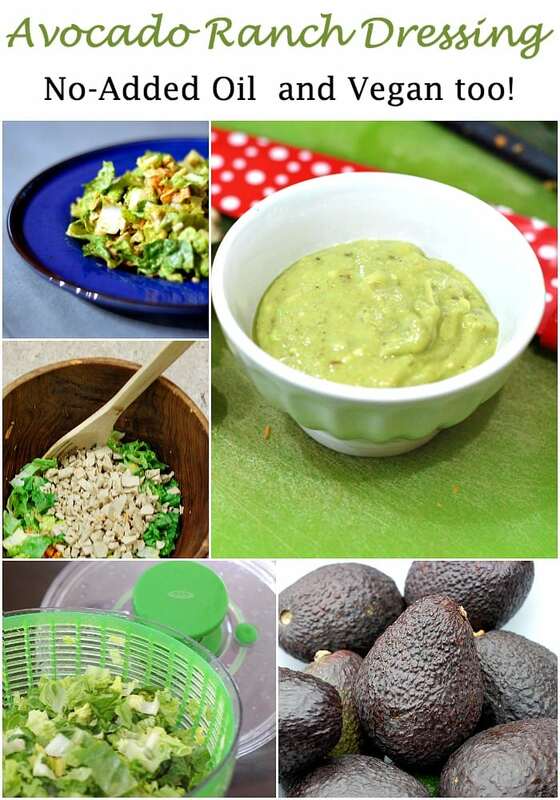 Scrape the avocado flesh into a small bowl and mash well. Add in all the other ingredients and mix until thoroughly combined. If the dressing is thicker than you want just add more nondairy milk tablespoon at a time until it's just the way you like it. 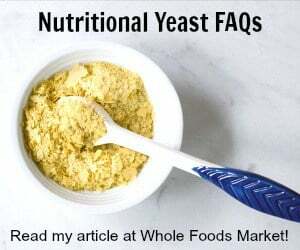 You can also add all the ingredients to a blender or food processor if you prefer a smoother dressing. I love the idea of creamy ranch dressing made with avocados, Kathy. What a gorgeous salad! In our family, big salads are often the whole meal so I am pinning this on my Recipes to Try board. Geo good one of my new favorites! OMG! It tasted so good!! Thank you for the recipe!